The SSM2164 quad VCA (datasheet, PDF, 330k) from Analog Devices, and its clone the V2164 from CoolAudio (we'll stick to the original name), was a popular audio component originally developed at SSM and subsequently manufactured and carried by ADI. Unfortunately the fab that made the SSM2164 was closed down and Music Group's CoolAudio division soon after came out with a copy/clone, and to this day it is an active line in CoolAudio's catalogue. The resurging interest in the analogue synthesizer market brought about an exciting development. Sound Semiconductor Inc was founded by members of the original SSM/ADI team to bring to market improved versions of some of the classic analogue chips. Their first offering was the SSI2144 voltage controlled filter (datasheet). Then, to much interest, came the SSI2164 (datasheet) - an enhanced version of the original SSM2164. The original designers took the opportunity to fix some of the problems with the SSM2164, make improvements to performance, and expand on the material in the datasheet. I will expand on specific improvements in the following sections. Unfortunately the original SSM2164 and the CoolAudio V2164 both exhibit a rather bad failure mode. Please note: this failure has been fixed (and verified) in the new and improved SSI2164. The SSM2164 exhibits a catastrophic failure mode when the V+ pin is powered and the V- pin is disconnected. The symptom is massive current flow into the V+ pin resulting in internal heating which, if not limited, results in destruction of the die. In a modular synthesizer system there is the possibility of accidentally disconnecting the negative rail. For example, the power supply could trip its negative output and disconnect it, or a power connector could become partially disconnected while moving the cases. If this should ever occur then all the SSM2164 devices that are in the modular synth will be destroyed. It is therefore especially important to protect the SSM2164 in these types of open systems (i.e., where users can add and remove modules themselves); in closed systems, where a supply connection cannot be so easily tampered with, this situation is very much less likely, but we feel that the information presented on this page may still be relevant. Note: this page is the joint work of myself and Oscar Salas. By far the best solution we have devised consists of adding a single Schottky diode with its anode connected to the V- pin (pin 9) and its cathode to Ground (pin 8). It appears that if the V- rail is disconnected the diode provides a safe path for current to safely flow out of pin 9 (V-) to ground without causing any damage to the SSM2164. The suspicion is that there is some sort of parasitic crow-bar that is triggered when the V- pin rises one diode drop (700mV or thereabouts) above GND. The Schottky stops this happening by hard-limiting the V- pin to about half that (300mV or so). This is the solution we recommend for all SSM2164/V2164 applications. Adding a BAT85 Schottky diode connected with its anode to pin 9 and cathode to pin 8 the current into pin 16 dropped to 0mA. Note: if the V- rail drops to 0V as opposed to disconnected, so that current can still flow into the V- rail, the SSM2164 behaves the same safe way. It is only in the situation where the V- rail is completely disconnected that this fault occurs. 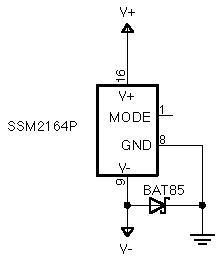 The SSM2164 is sensitive to reverse voltages. 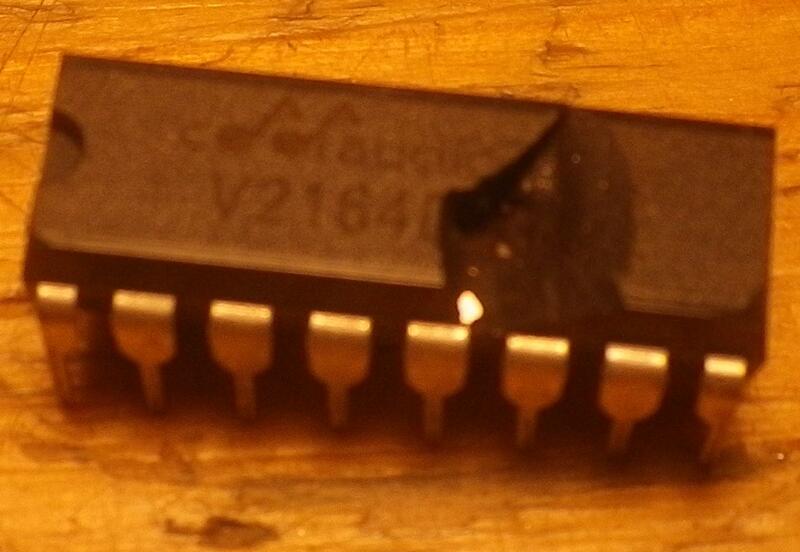 Experiments have shown that certain fault power conditions will immediately destroy an SSM2164 (JPG, 124k ... may be upsetting if you are of a sensitive chip-loving nature). By far the best way to protect the SSM2164 from reverse voltages is to use series Schottky diodes. One 1N5817 Schottky diode per rail is recommended. The previously recommended solution comprising Polyfuses and reverse diodes is less desirable due to firstly the high series resistance of polyfuses, which increases every time the circuit is put into the failsafe state, and secondly it puts undue stress on the power supply system. The following CAD symbols and libraries are provided without any warranty expressed or implied. Use at your own risk, etc. This information is provided "as-is". If you find an error please let me know.